We are super excited to have our Quote Review Feature all ready for our shopVOX users. They have requested it and have been waiting patiently for us to get it all ready! What is so special about the Quote Review in our shopVOX account? 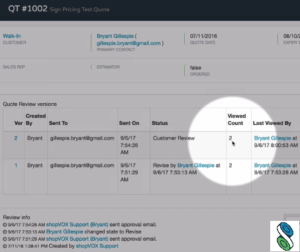 One of the most special benefits is that shopVOX users can track the email. This means that shopVOX users can know if the quote was viewed or not. In addition, you can view how many times the customer has reviewed the quote. (See the image to the left.) This is important to know how to follow up with the customer. If the customer approves a quote, this quote can be converted into an order without having to create an order since all information will be carried over from the quote to the order. If the customer does not approve the quote and wants to make changes, they can do so from their Quote Review. There is no need for them to call. Instead they can simple input all changes in the Quote Review and sent back to you. This is helpful because all of this information will be stored and kept in your shopVOX account for further review if needed. You can keep track of the sequence of steps regarding each quote. For example, you can track to see who sent it and what time they sent it. You can view who had changed the status and at what time they changed it. Pretty beneficial for being able to track your employees work, as well as your customers response.